Travelers Rest Lodge hosts four tranditional cabins that sleep two. Click on the cabin name below to view availability and photos. Traditional Cabins have one Queen bed, full bath, kitchenette with dishes, silverware, toaster, microwave, under-the-counter fridge, full size coffee pot with coffee and tea provided, dining area with table and chairs. 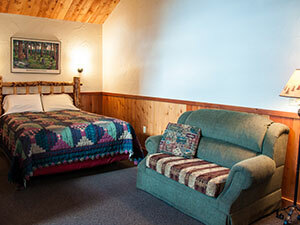 Cabins also have gas-log fireplaces and covered porches with comfortable seating.